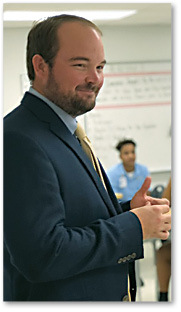 Cristo Rey Baton Rouge Franciscan High School announced the appointment of Eric Engemann as president, replacing Brian Moscona, who left earlier this year to accept the principal position at St. Thomas More School in Baton Rouge. Engemann has an extensive background in executive level, non-profit leadership, administration and development in Baton Rouge, having led SportsBR, Inc. as its president and CEO. Engemann also most recently served on the faculty of the School of Kinesiology at Louisiana State University. “Eric’s leadership experience, community relationships, strong demonstration of the values of St. Francis and work ethic, and his commitment to the school’s mission position him well to be the next leader of Cristo Rey,” said board chairman Bryan Jones. “I could not be more excited to begin my work with Cristo Rey Baton Rouge Franciscan High School,” said Engemann, who began his new position Oct. 15. “I am truly inspired by our students, faculty and staff, and am humbled to serve the students and families of this transformational school. Engemann holds a Bachelor of Arts degree in history from LSU and a master’s degree in education from Xavier University in Cincinnati, Ohio. In 2011, he earned a Master of Business Administration from the Flores MBA Program at LSU. A native of Pointe Coupee Parish, Engemann and his wife, Kacie, have three children and are parishioners at St. Aloysius Church in Baton Rouge. Cristo Rey is a Catholic institution that educates young people of limited economic means to become men and women of faith, purpose and service. Through a rigorous college preparatory curriculum coupled with a corporate work study program that enhances the educational experience by placing each student in a professional work environment sponsored by business partners in the community, students graduate ready to succeed in college and life.